The Beall-Washington house is a historic home on the corner of R and 30th St. It is one of the grand 19th century estates that dot upper Georgetown. The property is named after the Beall-Washington family, which was formed through the marriage of George Washington’s grand nephew and a descendant of Scotsman Ninian Beall, the original owner of much of Georgetown. It was also owned for a time by District of Columbia Governor H.D. 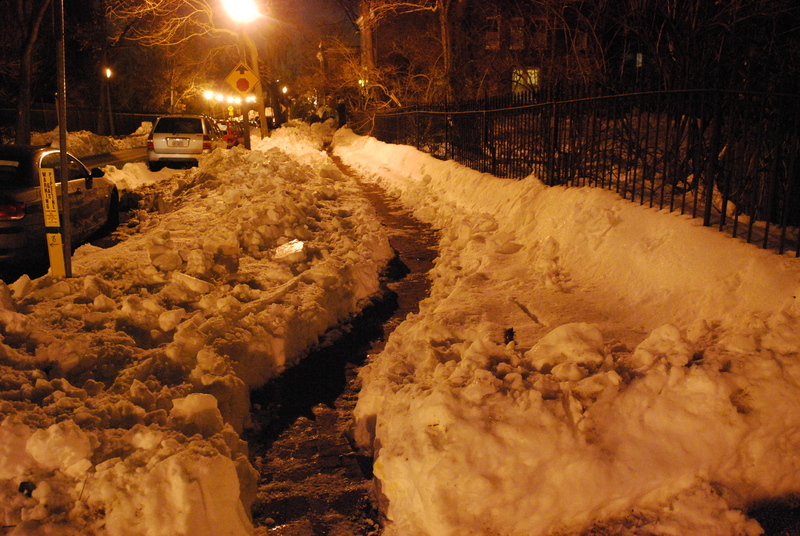 Cooke (who built Cooke’s Row on Q St.). The property has a large circular driveway, which gives the home an unusually country feeling in urban Georgetown. Nowadays, the home is better known as Katharine Graham’s house. The Washington Post owner lived in the house for decades and with her parties ensured that 2920 R St. was at the center of the Georgetown social circuit. After Graham’s death in 2001, the home was bought for $8 million by local private equity multi-millionaire Marc Ein. And in GM’s opinion, Ein has been a terrible steward of this historic home. First of all, Ein never actually moved into the house. He lives in the Palisades. Why he needed an $8 million pied-a-terre just a mile or so away from his actual home is a mystery. GM recalls reading an interview in the Georgetowner a couple years ago with Ein where he explained that the reason he bought the house was, essentially, because it was there to be bought (unfortunately the Georgetowner’s archives aren’t online). It has basically sat empty since Ein bought it. Occasionally its lawn hosts a wedding or some sort of elegant affair, but mostly it sits there abandoned. Considering the lively history it has seen, it is a shame to see it so empty. But the greater crime is not that it is empty, but rather that Ein is letting it fall apart. The elegant exterior is literally rotting away. GM has also heard that the interior is in poor shape as well. As Carol Joynt reported a while back, apparently Ein put the house back on the market almost within a year of buying it. It is not currently listed on MLS, but it would seem that it is still informally for sale. While the building is not so bad that we should be concerned about demolition by neglect, it is nonetheless in the interest of all Georgetowners who care about the preservation of our historic buildings that the Beall-Washington House not be allowed to continue to rot. 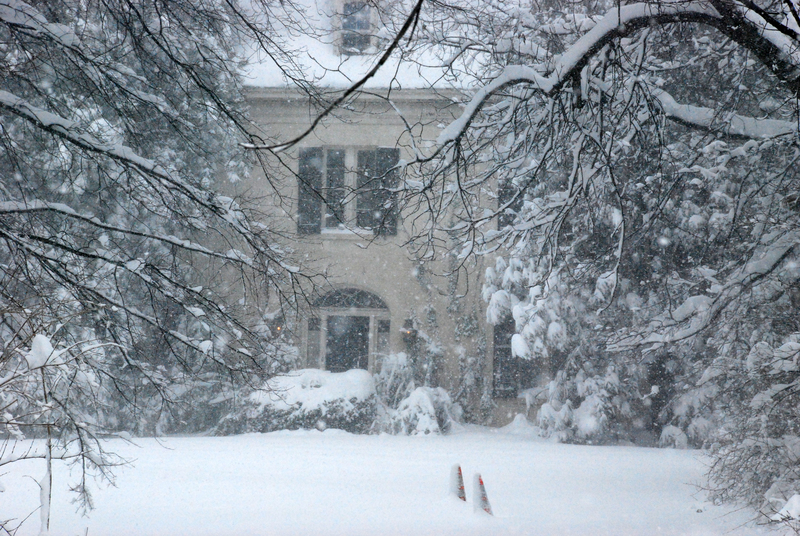 And speaking of historical preservation, while Ein owned the Beall-Washington house, the property was illegally subdivided without the requisite review by the Historical Preservation Review Board (and not for nothing, the law firm that filed the illegal subdivision was the same law firm that tried to subdivide Marc Teren’s Williams-Addison House). 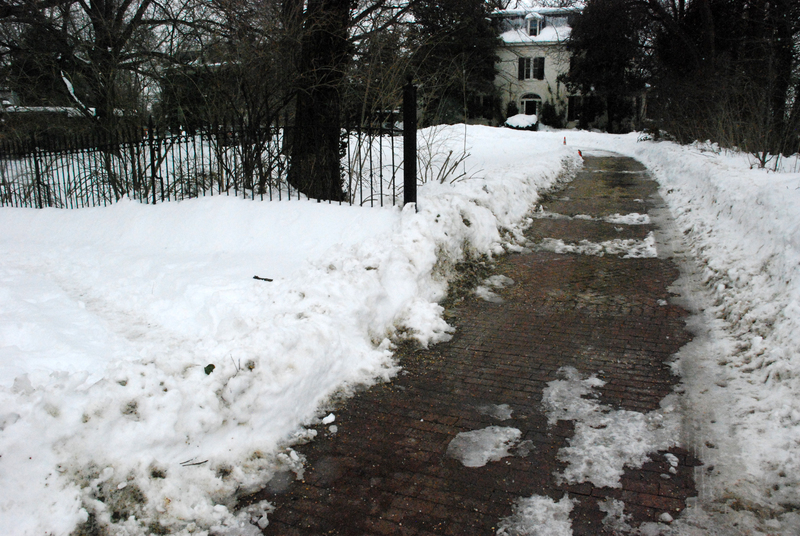 But the reason why GM chose now of all times to criticize Ein’s stewardship of the Beall-Washington House is simple: a total disregard of sidewalk shoveling requirements. 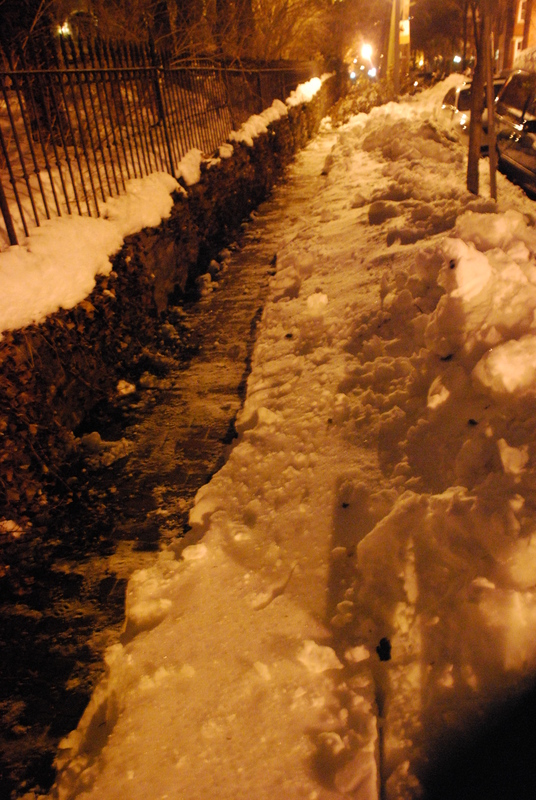 A good 100 feet of sidewalk on the east side of 30th street has not been touched by a single shovel. It’s built up so much that there isn’t even a trail of footprints. 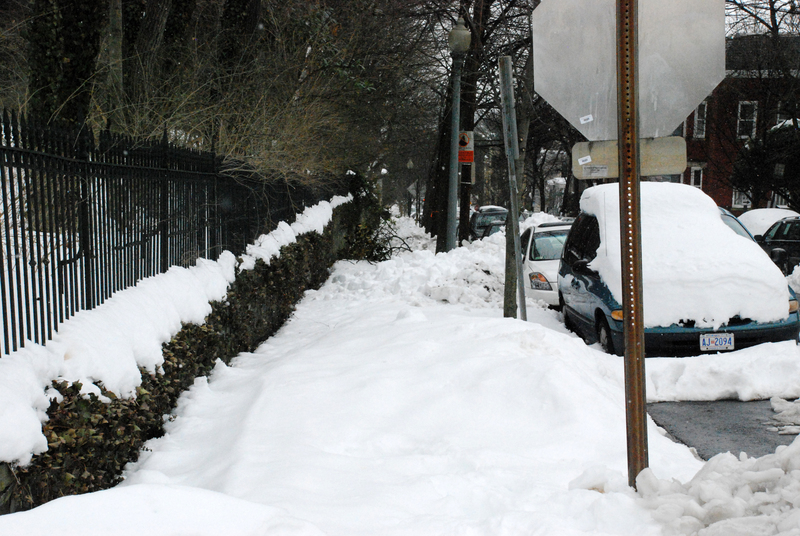 There’s a bit of a beaten path on the R St. side, but not much of one and the path has certainly not been shoveled. Mark Ein: Terrible steward, even worse neighbor. 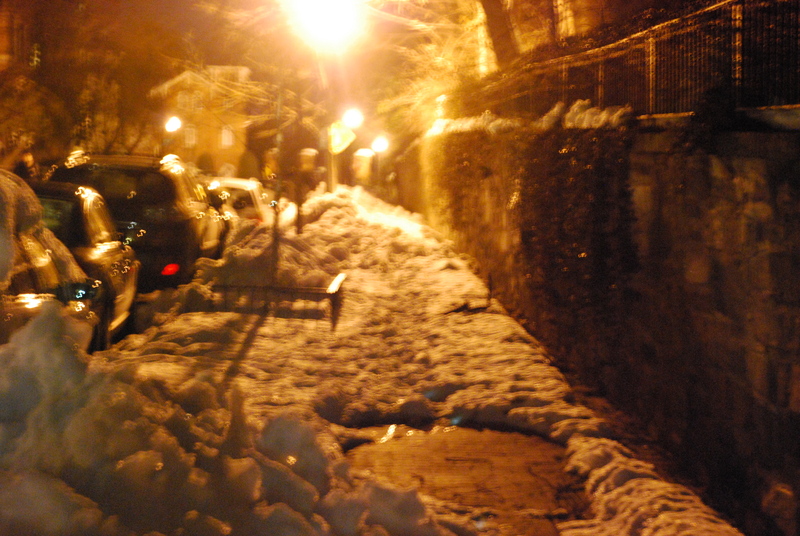 …about halfway down the shoveling stops. 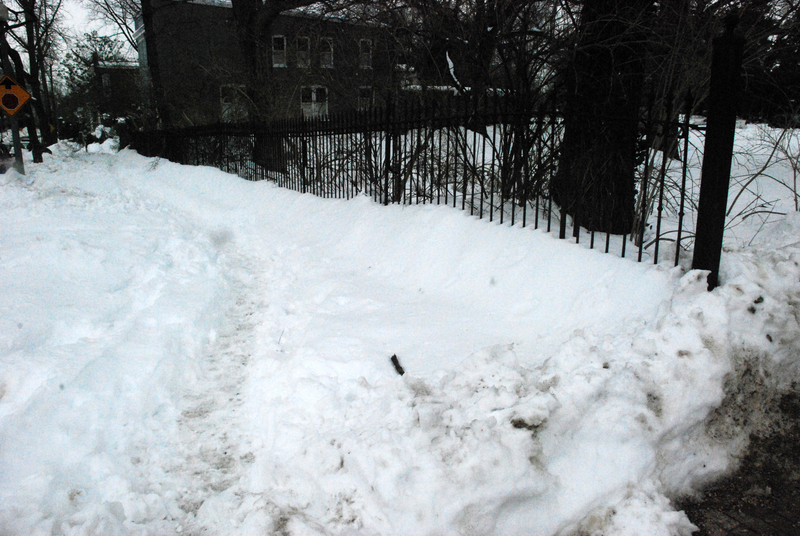 The vacancy of this home and its general neglect pose safety concerns, and not just from the absurdly unshoveled sidewalks. The stone wall that runs down the the long 30th street side of the property is interrupted by a small gate that is perpetually ajar. This area is dark and empty at night. Someone with criminal intentions could easily slip inside the gate, hide behind the wall, and then leap out to rob/assault a passerby. I may be a tad paranoid, but I won’t walk up the east side of 30th alone after dark. Right on, GM! This is a truly unfortunate situation and sad to see such a historic property fall into disrepair. Can the subdivision be challenged, since it was unlawful? In any event, let’s hope Mr. Ein Googles himself, as I suspect he does regularly, comes upon this article, and realizes how his neighbors feel about his behavior and the error of his ways. Yikes. If Mark Ein is such a lousy caretaker of his own investments, it makes me wonder how he’s treating mine. My ancestors, the Alexander family, once owned this house (my Great Grandmother grew up there) and while researching was sad to find out it has been so neglected. My Grandmother had many heirlooms which we grew up knowing came from “the Georgetown House” and she enchanted me with stories of her childhood visiting there and what life was like in Georgetown in the late 19th and early 20th century. I hope the situation has improved! Owning a vacant property like this is expensive in Washington, particularly if it is valuable: the Class 3 (“vacant real property”) tax rate is nearly six times the rate for an owner-occupied property. (If the property is indeed “blighted,” the Class 4 rate is twice the Class 3 rate.) However, the city’s real property assessment database does not seem to list 2920 R Street so that the rate can be verified. I hope that GM has looked into this to make sure that the correct rate is being paid to our beleaguered city treasury. I am a descendant of the Beall-Washington family, and if there were any way I could afford it I would buy this lovely home in a minute! Is there any way the local historical society could purchase it and use it as a museum or something?